During my teen and college years, I was a bit obsessed with resolution setting. Flash forward many years and I no longer make resolutions. I’m curious – do you make resolutions at the start of the calendar year? I don’t have anything against resolutions. Making space for self-reflection, connecting to values, and re-prioritizing limited resources to live your fullest life is a really beautiful thing. I guess I’ve just loosened up a bit and I think that’s a-ok.
A couple of years ago I learned about the concept of identifying a single word to guide you through your year. Essentially, it’s a word to help you create intentional life choices and to check in with periodically. For me, this concept has been really inspiring. So for 2018, I have chosen the word: BALANCE. I find that my self-care is always a mirror to other things in my life. Balance is vital to healthy relationships but also vital to how I approach sleep habits, grocery shopping and food prep, as well as exercise. The balance of all of these self-care pieces shifts and changes a bit and striking the right balance at any given time is more like an art than a science. So here’s to “remaining upright and steady” in 2018! 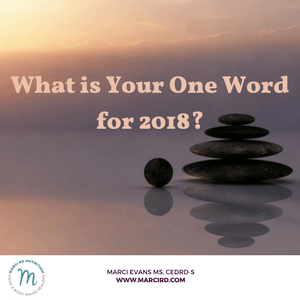 I’d love to know, if you had to choose your one word for the year, what would it be and why? How would that word influence your health and self-care choices? I can’t wait to hear about it.